I love this outfit for its femininity, sexiness, and its touch of masculinity with its subtle take on the tuxedo. I left the tie only partially tied for this look, but I also think this tie would be super cute as a bow with a skater skirt and heels or even with a pair of jeans. 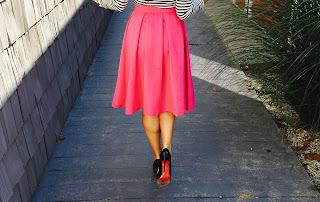 This skirt is also super transitional as it can be paired with sweaters in red, emerald green, or cobalt blue. The two pieces are adorable together, but can also be created into different outfits separately.